High purity water applications can take advantage of our service deionization with portable DI exchange for the Indianapolis and Indiana areas. Nancrede Engineering offers a full range of two-bed and mixed-bed industrial deionizer exchange tanks. These DI tanks are installed at startup of the deionization system. As the DI tanks are exhausted, new fully regenerated tanks are delivered through our service deionization (SDI). A Liqui-Cel membrane contractor system is ideal to remove carbon dioxide (CO2) in front of the anion or mixed bed exchange DI tank to greatly increase efficiency and reduce change out costs. Nancrede Engineering’s Industrial DI exchange tanks are either two-bed or mixed bed units with an acid-regenerated cation connected in series with an alkaline-regenerated anion vessel. The cation resin is a strong acid type and is regenerated with hydrochloric acid (H2SO4 also available) at our factory. The anion resin is a strong base type II and is regenerated with sodium hydroxide. The exchange tanks are sized based on flow rate and gpd (gallons per day usage). The quality of the demineralized (DI) water is normally within a 10-25 micro ohm range when influent water qualities are 15 grains per gallon total exchangeable anions or less. Operating conditions and an actual influent water analysis are required for predicting more exact capacity, leakage level, and service flow duration. These industrial demineralizers require single-point utility hook-ups for economical installation and startup. Their simple exchange of the tanks maximizes the efficiency and consistency of water quality of the units in order to provide a truly reliable water treatment unit. NOTE: Where removal of silica and carbon dioxide are not required, a weak base two bed demineralizer may be considered. Strong base anion resin type units are used in the preparation of waters for boiler make-up, process work, or where TDS (Total Dissolved Solids) reduction is required. These units work most efficiently where the TDS level of the water to be treated is less than 600 ppm. Nancrede’s DI exchange tank units employ cation followed by anion resins in separate beds. They produce demineralized (DI) water with total mineral contents below 4.0 ppm. Actual effluent qualities vary based on chemical dosages utilized and actual influent water qualities. 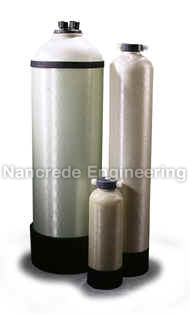 Nancrede Engineering’s exchange tanks demineralizers remove virtually all ions from water including silica and carbon dioxide. The more complete mineral reduction of the SBTB demineralizers make them ideally suited to treating water for high pressure (over 600 psi) boiler use. The low tolerances of these boilers to mineral build-up makes the strong base demineralizer a must for low blowdown waste and savings of both fuel and internal chemical treatment. The low silica content produced by strong base demineralizers is especially important where steam is used to drive turbines. Manufacturing processes that add water directly to a finished product, or washing and rinse operations where spot free drying is important, also use strong base demineralizers. Additional applications include metal plating, closed loop cooling water, and clean air humidification, among others. Influent waters with total mineral contents above 600 ppm usually require reverse osmosis (RO) or similar type mineral reduction equipment ahead of the strong base demineralizer. A degasifier installed between the strong acid cation vessel and the strong base anion vessel is recommended when the raw water influent contains high levels of carbon dioxide or alkalinity. The degasification (carbon dioxide removal) will reduce operating costs and initial equipment costs as the anion load is proportionately reduced. When ultra-pure quality water is required for very high pressure boilers or electronic parts washing, for example, industrial polishing mixed bed demineralizer exchange tanks may be installed following a strong base demineralizer. Nancrede Engineering’s strong base anion two bed demineralized (DI) exchange tanks are designed and manufactured for industrial applications. They are rugged, pre-engineered, pre-assembled catalogue units that minimize expensive installation and startup costs. They require simple utility hook-ups (raw water inlet, drain, and demineralized (DI) water outlet for immediate online service. Easy installation and change out of units by Nancrede Engineering. Ion exchange vessels: 100 psi design non-code construction. Regenerant: No regenerate is necessary for the demineralizer (DI) water tanks. All regeneration is done offsite at a Nancrede Engineering facility. The strong base demineralizer is a two vessel system. Water first passes through a strong acid cation exchange vessel, where the ionizable salts in the water are converted to their respective acids. The water then passes through the strong base anion exchange vessel, where the negative radicals of the acids are converted to hydroxyl (OH-) ions. The result is a water containing only hydrogen (H+) and hydroxyl (OH-) ions which combine to form pure water. The strong acid cation vessel contains resin similar to the strong acid resin used in a water softener. However, it is regenerated with an acid to convert the resin to the hydrogen form, where it can readily remove cations such as calcium (Ca+2), magnesium (Mg+2) and sodium (Na+) from the water. Either hydrochloric acid (HCl) or sulfuric acid (H2SO4) may be used, with the provision that the use of sulfuric acid requires some equipment modifications to avoid a calcium sulfate precipitation during the regeneration process. Exchange capacities range from 15,000 to 30,000 grains per cubic foot depending on the type of cations present in the influent raw water, the effluent water quality desired, and the amount and type of acid regenerant used. The strong base anion vessel contains anion exchange resin. It is regenerated with caustic soda (sodium hydroxide NaOH) to convert the resin to the hydroxyl form, where it can readily remove anions such as chloride (Cl-), sulfate (SO4-2) and nitrate (NO3-) from the water. The strong base resin (unlike the weak base resin) is also capable of removing the more weakly ionizable substances such as carbon dioxide (CO2) and silica (SiO2). Capacities range from 10,000 to 20,000 grains per cubic foot, depending upon the type of anions present, the quality of water desired and the amount of caustic regenerant used. Raw water alkalinity is converted to carbon dioxide in the strong acid cation vessel. When the alkalinity to total anion ratio is excessive, the load on the strong base anion resin can be significantly reduced and operating efficiency increased by installing a degasifier prior to the strong base vessel.